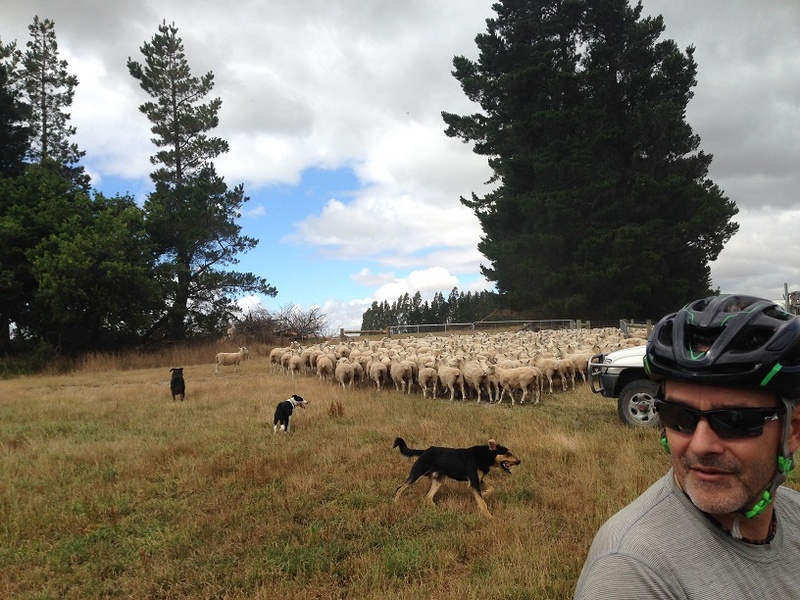 We have seen and “baaaaa’d” at our fair share of sheep while riding through New Zealand. According to James Peary (Sp?) a 92 year young sheep farmer we first met in Papatowai, enjoying an ice cream and then again in Curio Bay, also enjoying an ice cream – there used to be a lot more sheep in New Zealand – on the odds of 90 million sheep not too long ago. “Now”, James said sadly, “more farmers are turning to dairy”, as he stops for a moment to lick his ice cream, “and sheep farming is down to maybe 19 million sheep”. There are still far more sheep than people – especially on the South Island. He was an interesting man – he has sold sheep all over the world. The only place he had difficulties sending sheep to was the US – where he said he sent them to Canada and they walked across the border (he was quite the joker). 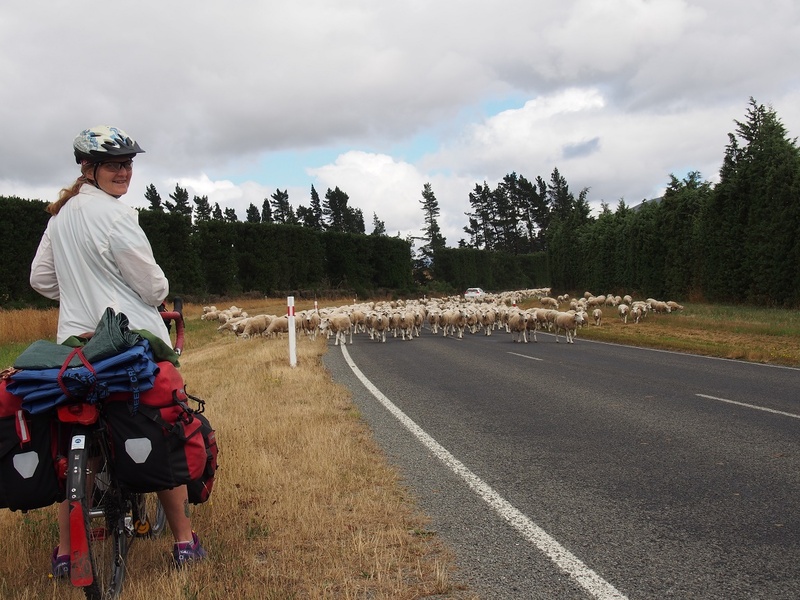 Our first major encounter with sheep was in the form of a Sheep Jam – when the farmer needs to move the sheep from one field to another via a public access road. They put out a orange warning sign with a picture of a a sheep and then a sea of sheep come down the road, followed by dogs, a truck and sheep herder. Pretty amazing to watch. Here are two videos of our first Sheep Jam: Sheep Jam 1 and Sheep Jam2. We have discovered two uses for sheep bones – fortunately we haven’t seen too many sheep bones on our travels – we mostly see rabbits, possums and birds as road kill. 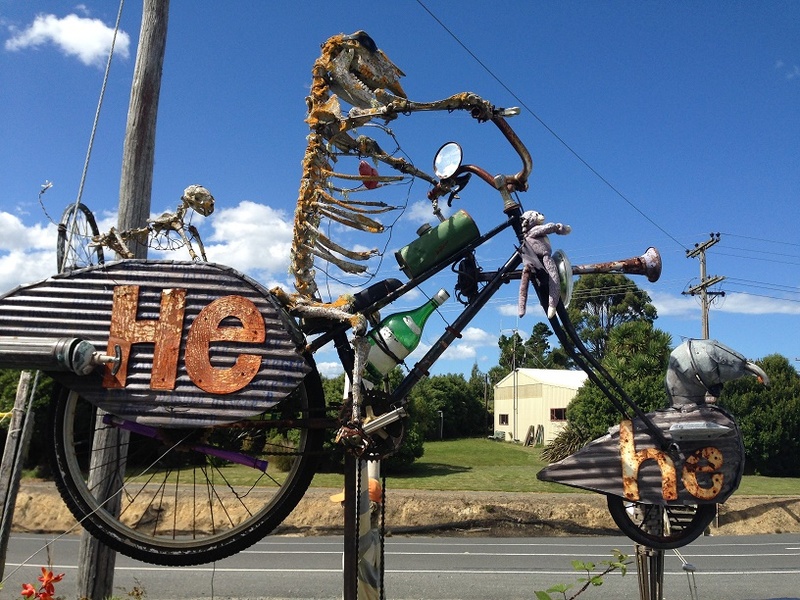 Use #1: Make a moving statue: This lovely statue (video here) was spotted at the Lost Gypsy Gallery in Papatowai. This gallery is an eclectic collection of curios – you can spend hours just in the gallery – let alone the theater. Blair is an interesting guy who spends his time creating, building and sharing his creations with the world through his gallery. 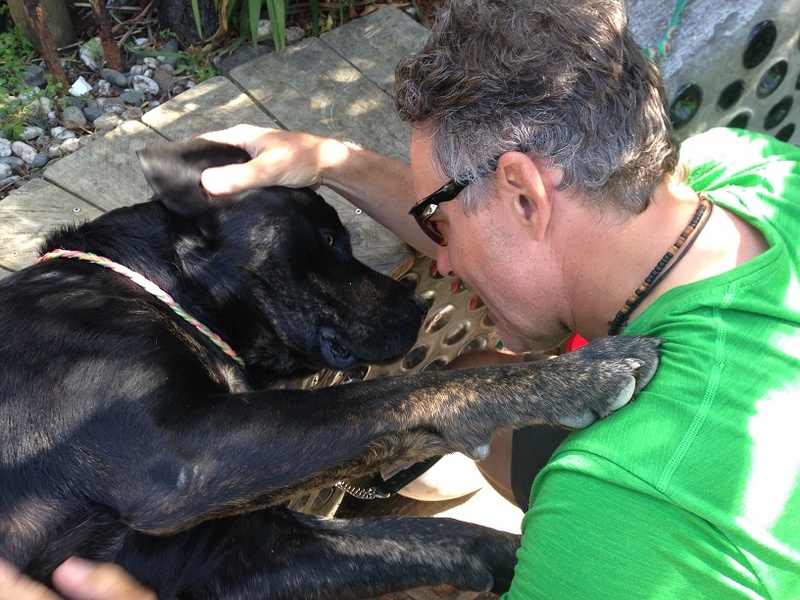 There is also an onsite small refreshment stand and a beautiful dog named Clyde. 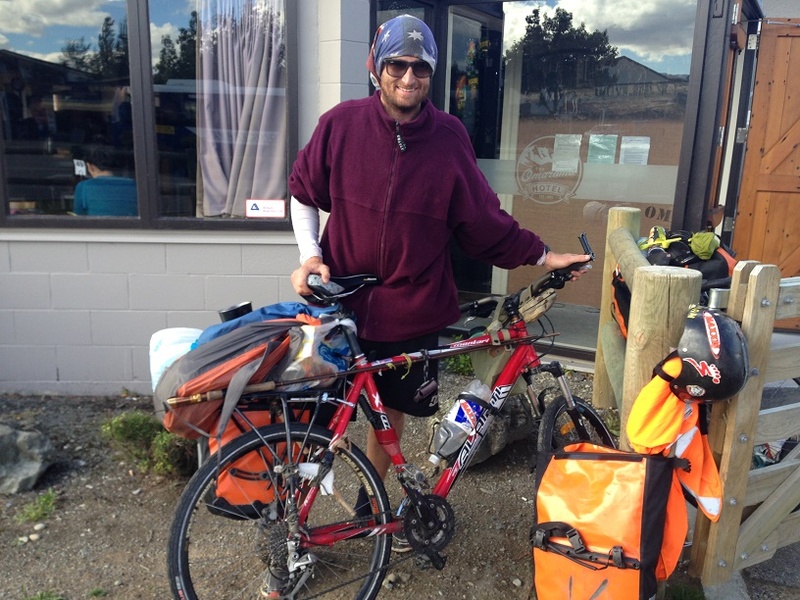 Use #2: Fix your broken back rack for your panniers. The mandible works best for this fix. 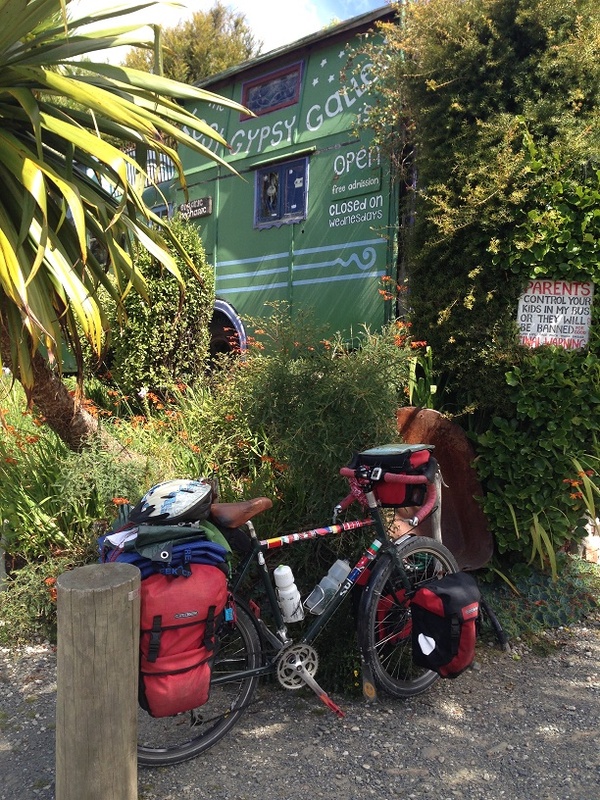 We met Una and Ben in Omarama and had a fantastic chat over a beer. They were heading towards Mt. Cook and we were traveling the opposite direction. Una is studying to be a nurse and has the most beautiful smile. Ben pilots a boat in Queensland Australia. 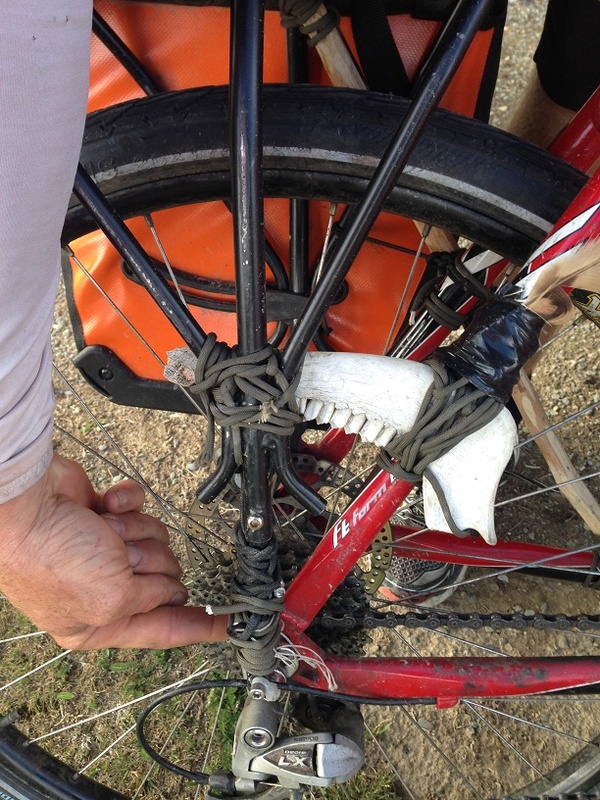 Ben is quite a MacGyver – AKA a fix-it guy and put together this solution for his broken rack. 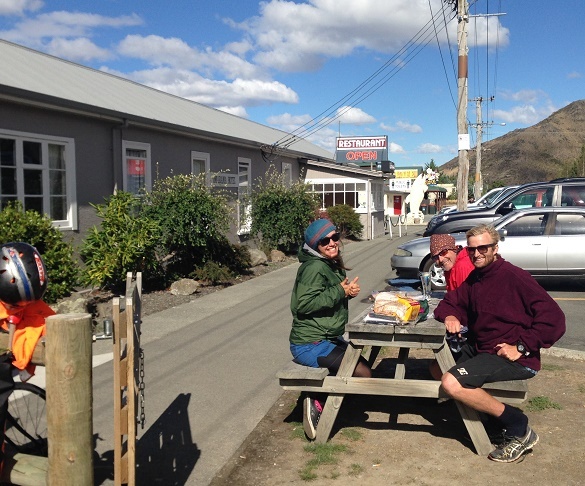 Ben, Una and Jay – enjoying a windy afternoon in Omarama. Sheep mandible as a fix.